How Much Does the 2017 RAM 1500 Cost? How Many MPG Does the 2017 RAM 1500 Get? What’s New for the 2017 RAM 1500? The 2017 RAM 1500’s base engine is a 3.6-liter V6. This engine produces 269 lb-ft of torque @ 6,175 rpm and 305 horsepower @ 6,400 rpm. For fuel economy it can provide up to 25 miles per gallon (mpg) highway and 17 mpg city when had with two-wheel drive. An alternative to the 3.6-liter V6 is a 3.0-liter turbodiesel V6 engine, which not many half-ton trucks like this one offer. This engine will produce 420 lb-ft of torque @ 2,000 rpm and 240 horsepower @ 3,600 rpm. Then, there’s the available 5.7-liter Hemi V8 engine. This will get you 410 lb-ft of torque @ 3,950 rpm and 395 horsepower @ 5,600 rpm. If you get this engine with an eight-speed automatic transmission and two-wheel drive then the top fuel economy you will get is 22 mpg highway and 15 mpg city. Eleven trims are available for the 2017 RAM 1500. Because there are so many, we’re not going to go into detail about all of them here, but just know that these trims range from a loaded hauler to a basic work truck that could even be used as a luxury truck if one desires, and that you can suit the truck to meet your budget or individual tastes. The base Tradesman comes with a tilt steering wheel, a locking tailgate, a six-speaker radio, an auxiliary input, a USB input and air conditioning. A Uconnect Access infotainment system is available with a user-friendly interface and an 8.4-inch touchscreen. Other options include a ten-way-powered driver’s seat, a heated steering wheel, a 115-volt household power outlet, rain-sensing windshield wipers, LED bed lighting and more! The vehicle comes with four-wheel anti-lock brakes, a front center three-point belt, stability control, tire pressure monitoring and front head airbags. Also available are two front headrests, dual front side-mounted airbags, a passenger airbag deactivation switch, a ParkView Rear Back-Up Camera, trailer brake control and stability control. Per Edmunds brake testing this vehicle, when had with either the gas V6 engine or the diesel V6, could come to a complete stop from sixty miles per hour (mph) in 128 feet. In government crash testing this truck earned five stars for total side-crash protection. The vehicle did well in Insurance Institute for Highway Safety testing, too. 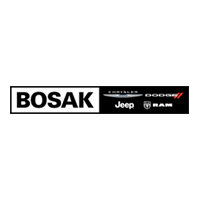 Come to Bosak Motor Sales when you have some free time. We look forward to assisting you with your vehicle search here at our dealership! If you have any questions before you head down then feel free to give us a call today.